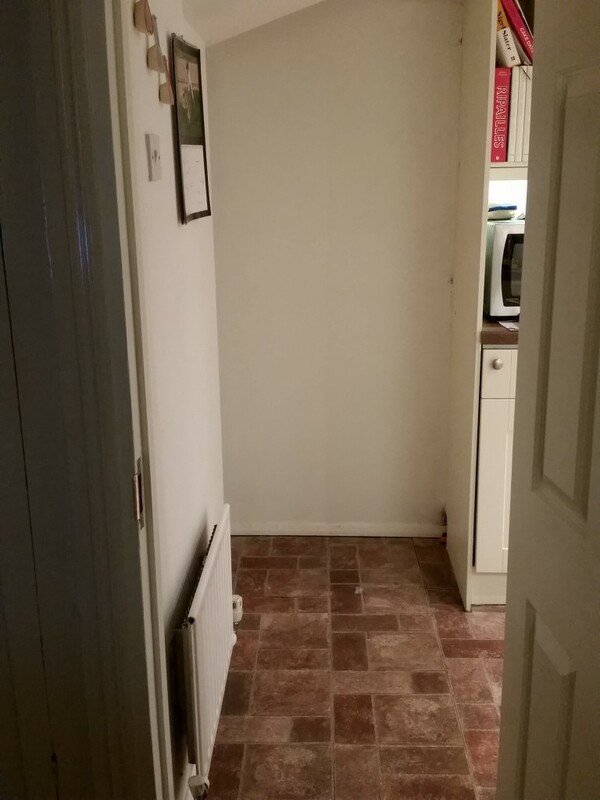 So yesterday I wrote a little post about how we were meant to get a new kitchen floor. I even smugly wrote that it would be the last day I had to look at the horrible browny-red-dirty-nasty floor. Only, the new floor never came yesterday. After we dragged the fridge freezer out of it’s corner, huffing and puffing and swearing along the way, to plug it in in the hallway which scared the dog and meant we had to be as thin as rulers to get past; after I took everything I thought I could possibly need for 5 hours of the kitchen being out of action and put it in the dining room, our floor didn’t come. I had a call about half an hour after they were meant to turn up, saying that the vinyl we had ordered hadn’t yet arrived so we needed to re-arrange. The OH and I are deeply suspicious and basically think they simply overbooked a job and we got the cut. I stomped around for a bit and then left to go to Pilates; he came home and pushed the fridge back in and I decided to write about toilets instead of pictures of our new kitchen floor. The kitchen is a funny old part of the house and I’m guessing it must have originally been lean-to or something – it’s slightly extended to the side which means it’s a teensy bit wider than a galley kitchen but has a much lower ceiling when compared to the rest of the house which I just can’t figure out. Honestly, bearing in mind how many shonky jobs we keep uncovering, it’s probably not worth investigating too closely until we need to. Most of the appliances are integrated but we had to buy a special sized fridge freezer since a normal standard one just wouldn’t fit under the slightly sloping part of the ceiling which has a tiny bit of the staircase running above it. Eventually we’d like to steal this little part of the kitchen where the fridge/freezer is, as well as a bit of the understairs cupboard and see if it would be feasible to create a downstairs toilet since we don’t have one. So I’ve been looking on t’interweb to get some inspiration! 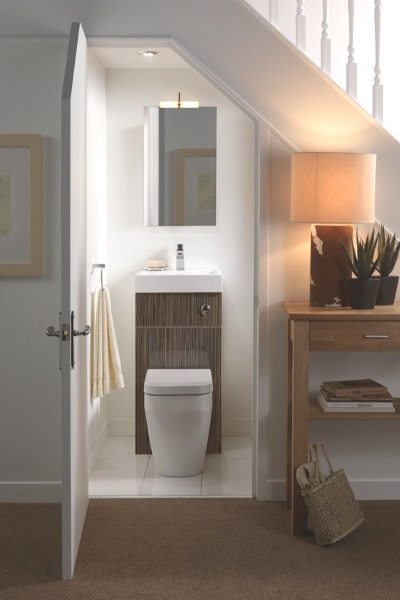 I really love the top image design (although I’m guessing this is actually a separate toilet which is meant to go with a bathroom since there doesn’t appear to be a sink) and as that fridge space backs on to an external wall I’d like to put a little window in if possible. The middle image is fabulously quirky and clearly making great use of the available space. 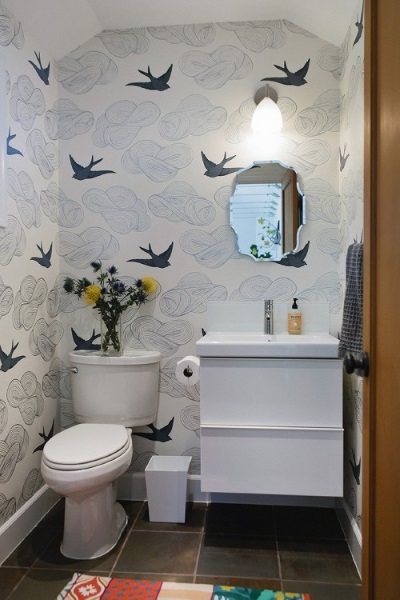 The final image isn’t my style in terms of the toilet/basin but THAT wallpaper is totally dreamy. 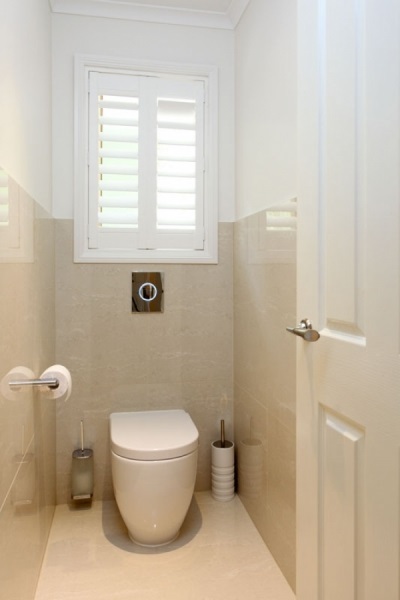 Do you have a downstairs toilet, or a project that you never think will get finished? I’d love to hear about it.